Dr. Earl McLeod was disciplined by the Maryland medical board over the death of an abortion patient on December 21, 1997. A now-defunct group called WAKE-UP identified her by name -- Jennifer M. Halner -- but do not indicate where they learned her identity. The Social Security Death Index does indeed show a Jennifer M. Halner, 27 years old, died in Maryland on December 21, 1997, which does tend to confirm their identification. 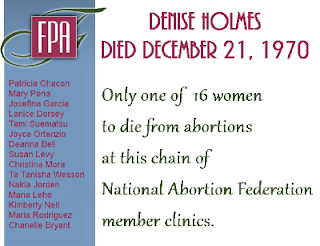 On December 20, 1997, the 27-year-old woman went to Potomac Family Planning for a safe, legal abortion, to be performed by D&C. She was 6 weeks pregnant. She had no significant medical or surgical history, but had undergone a prior abortion performed by McLeod in 1995, under general anesthesia, with no complications. McLeod's anesthesiologist, identified in records only as Dr. K., started an IV, and the woman was hooked up to a cardiac monitor, blood pressure monitor, and pulse oximeter. Dr. K administered Versed (for sedation and memory impairment), Sublimaze (a short-acting narcotic used for short-duration pain control), Propofol (a sedative for anesthesia), with Lidocaine, a local anesthetic. Jennifer breathed on her own during the entire five minutes of the abortion. She was transferred to recovery at 10:10 a.m., still unconscious but breathing on her own. Her blood pressure was charted as 112/60 (normal), but her pulse was 103 (very rapid). A nurse identified only as Nurse W put an oxygen mask on the patient, but she was taken off the cardiac monitor and pulse oximeter when she was moved to recovery. After Jennifer's vital signs were documented, another nurse, identified as Nurse H, took the blood pressure cuff off of her and put it on another patient. Meanwhile, McLeod was in a second procedure room, doing an abortion on another patient. At around 10:20 a.m., Nurse W noticed that Jennifer was still unresponsive. She told a nursing assistant to get Zoloft (an antidepressant) from the anesthesiologist, who was still in the second procedure room with McLeod. As the assistant was leaving, Nurse W change the request to one for Zofran (an antiemetic). Then Nurse W went into the procedure room herself to get the Zofran. Dr. K gave the Zofran to Nurse W without evaluating the patient. There was no record that Jennifer had suffered any nausea or vomiting to warrant the drug in question. At about 10:25, Nurse W administered Zofran to Jennifer through her IV. Not surprisingly, administering an antiemetic did nothing to revive her. Nurse W returned to the procedure room and asked Kr. K for Romazicon, a more appropriate drug, since it is used to reverse the effects of drugs used for anesthesia. Dr. K again provided the drug to Nurse W without examining the patient. Nurse H went to take Jennifer's blood pressure, and she realized she couldn't find a pulse, and that the patient's pupils were dilated. She fetched Dr. K to assess his patient immediately. He found her unresponsive, with a blood pressure an alarmingly low 60/40. He stared a second IV and began to perform CPR, using a pediatric-sized bag-valve mask. Nurse H took over ventilating Jennifer, continuing to use the pediatric-sized bag-valve mask. This device would be unable to pump sufficient air into the lungs of a normal-sized adult. Meanwhile, McLeod performed two other procedures before finally entering the recovery room and finding his staff performing inadequate CPR on his patient. He administered additional IV medications, and said that Jennifer was hooked up to an EKG monitor even though there was no documentation whatsoever of her cardiac rhythm. She was also not hooked up to a pulse oximeter that would tell the staff how much oxygen was in her blood. A pulse oximeter is standard monitoring for post-surgical patients and for patients needing emergency care; failure to use it on this patient was inexplicable. Also, despite the presence of two doctors, two nurses, and at least one nurses' assistant, nobody documented respiration, lung sounds, or any neurological evaluation, all standard for treating an unresponsive patient. Dr. K told somebody to administer Epinephrine, Ephedrine, and Lidocaine -- all appropriate drugs for treating a patient in cardiac arrest. Finally, at around 10:42 a.m., McLeod told somebody to call 911 -- something that should have been done as soon as she was found to be unresponsive. Paramedics arrived and found Jennifer in cardiac arrest. The anesthesiologist could not tell them anything about the patient's heart electrical activity, which he should have been noting on the EKG. They noted the use of a pediatric bag-valve mask, and the fact that nobody had put a breathing tube into the patient to ensure that air was being pumped into her lungs and not her stomach. The medics immediately began appropriate resuscitation, intubating Jennifer, ventilating her with an adult-sized bag=valve mask, hooking her up to a cardiac monitor, defibrillating her, and administering appropriate drugs. The medics transported Jennifer to Shady Grove Adventist Hospital, arriving at 11:09 a.m. The ER physician noted that the patient's pupils were fixed and dilated. After aggressive resuscitative efforts by ER staff, Jennifer's heart was restored to a stable rhythm, and she was admitted to the Intensive Care Unit. But despite their best efforts, she died at 4:15 a.m. on December 21. The appalled paramedics reported McLeod to the medical board, which faulted him with failure to provide adequate and readily-available post-operative monitoring equipment, and failure to provide adequate emergency supplies. The board also required him to get his staff properly certified in CPR. McLeod also ran the Hillcrest abortion mill in Harrisburg, Pennsylvania, where Kelly Morse had died in 1996 after being inadequately resuscitated. Kelly's husband filed suit, noting, "No respiration rate was recorded, no pulse was checked and no blood pressure was measured. No EKG was applied. No cardiac monitoring was conducted. No pulse oximeter was applied. No intubation or emergency tracheotomy was performed." Evidently McLeod chose not to learn from Kelly's death the lessons that would have saved this Maryland patient's life. Denise J. Holmes, a 24-year-old Australian woman living in Texas, decided to undergo a safe and legal abortion at Avalon Hospital in Los Angeles, California, on her way home for Christmas of 1970. Denise checked into Avalon Hospital (an abortion facility owned by Edward Campbell Allred) on December 21. Denise suffered an amniotic fluid embolism that carried pieces of fetal bone marrow into her lungs. She was pronounced dead by Edward Allred at Avalon at 5pm. 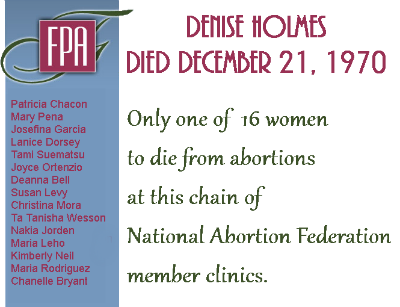 Denise is the first confirmed abortion death at an Allred facility, before the National Abortion Federationwas founded, with Allred's Family Planning Associates Medical Group as a member. Note, please, that with overall public health issues such as doctors not using proper aseptic techniques, lack of access to blood transfusions and antibiotics, and overall poor health to begin with, there was likely little difference between the performance of a legal abortion and illegal practice, and the aftercare for either type of abortion was probably equally unlikely to do the woman much, if any, good. In fact, during the first two thirds of the 20th Century, while abortion was still illegal, there was a massive drop in maternal mortality, including mortality from abortion. Most researches attribute this plunge to improvements in public health and hygiene, the development of blood transfusion techniques, and the introduction of antibiotics. Learn more here.